There’s no day you open a news website or a printed newspaper and you do not find any article about social media or social networks. And increasingly, there are no talks with friends where you don’t mention the word “Facebook”, whether it’s about an event, a birthday or a photo album or some other gossip about your friends. So, while the big giants of the web (unless you spent the past couple of weeks in a cave you should know I am talking about Facebook and Google) place their army on the two main buttons of your mouse, I started investigating how big is the social media effect on the business side of our life and what we should expect in the future. Surely, when scrolling down the virtual wall of my Facebook friendsfeed, I can tell there is a huge Facebook penetration in the business world (at least considering how active my friends are on commenting pictures and updating their status during their working hours). After all, if one every 6 minutes is spent on Facebook (according to ComScore’s research), some of those minutes must come from your office time. I heard someone bought an iPhone to stay on Facebook during office hours, after their company blocked access to it. But, seriously: how big is Facebook penetration in today’s business? We all know big brands and large companies have a massive social media presence. But how many companies are really adopting social media as part of their strategy? I found an interesting study on adoption of social links and plugins by the world’s 10000 largest websites. It provides a clear proof point we are just half way through the way that brings business close to their customers. 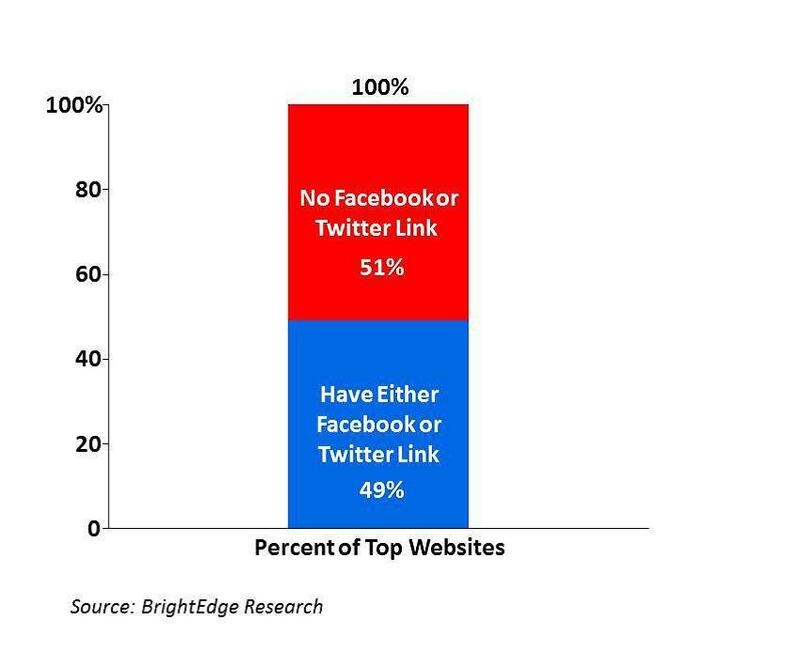 Less than 50% of the top 10000 websites have links to either of the two major social networks (Facebook and Twitter) on their front pages. This gives us an interesting view of where we actually stand, what Social Media really is, and gives us room to understand what we should expect in the forthcoming months. Social media are about a new technology-based channel, and this is exactly how we should consider it.Social Media are not about a new marketing strategy. While IT has become part of every company strategy, since it affects all units of a company, it seems social media (yet being substantially a “technology”), has not become part of the company strategy, though it’s about the company brand, and not just the number of fans on a facebook page. At least, this is true for about half the companies, it seems. We should of course consider those “less educated” companies in terms of being less educated in social networks. – traditionally, when talking about marketing, B2C marketing has been the one of the “early adopters”. Data confirm this theory for social media adoption by business brands: B2C companies are those topping the ist of most followed pages on Facebook and handles on twitter. – Interactions in the B2B business are those who likely happen in the senior executive level of companies: they are those taking decisions, they are those likely more “aged”, and they are those who we may likely consider being in the “late majority” and “laggards” portion of the “Rogers’ bell curve”, and they seem also those who have a higher presence on LinkedIn (the business network), which, in fact, has older users than the two most used social networks Twitter and Facebook. Future scenarios for business: What shall we expect in the future of social media? – Social media marketing is all about building and increasing brand reputation while dealing directly with clients. To listen to them mainly, and to tell them also. This means increasingly, companies will centralize their brand strategies and integrate it with the company (marketing) strategy- which means social media strategy will call marketers and IT departments to talk more and more, like IT talks with company execs today. – B2B marketing will increasingly adopt the social media channel, and will likely develop a bigger presence on major social networks, including LinkedIn. This also means those companies operating in the B2B business will have to learn how to develop a “brand” strategy. The good news is B2B already knows how important is to “listen”. – LinkedIn, Facebook and Twitter users will have a more similar average age. – Google+ and its pages for business will have a relevant impact on the social media marketing games and they have the huge potential of attracting those markets whose presence is not yet that high in social media. boοkmarked! !, I really like your blog!